If you have premium voices turned on, then the system will default to using the premium voices. If the premium voices are unavailable or turned off, we use the voices that are pre-installed on the device that your student is using. Voices vary quite a bit between devices and the operating system on the device. For example, OS X 10.9 had a wide variety of voices; some that are quite annoying. On OS X 10.11 and beyond, the voices were standardized and sound very nice. Many of the voices and children’s reaction to them boils down to the child’s taste. For that reason, we added the ability to turn off undesirable voices. On the device that your student is currently using, navigate to the Dashboard and click the Edit Avatar button above the avatar. 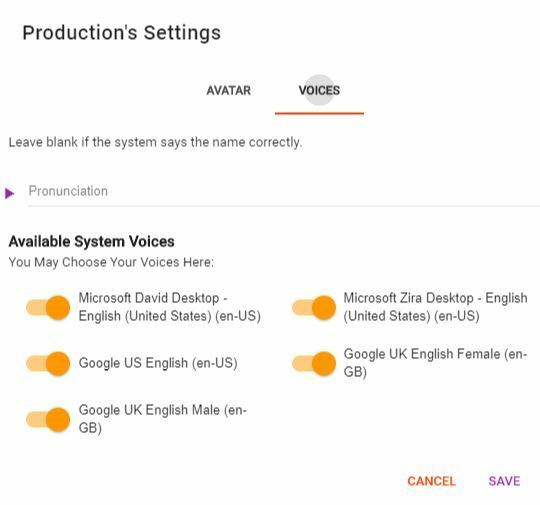 On this screen, you may change the pronunciation of your student’s voice by modifying the spelling to sound out the name as you wish it to sound. Hit the play button to ensure that it is correct. Turning voices on and off will announce the voice so that you may hear how it sounds and ensure that you are okay with the choice. Please remember to hit save when you’re finished.